MANILA, Philippines — Michael Calisaan’s final season for San Sebastian College did not go exactly as planned, but he and the Golden Stags still managed to salvage a measure of pride in the NCAA Season 94 men’s basketball tournament. Behind a 24-point, 12-rebound effort from the graduating big man, the Golden Stags ripped the Arellano University Chiefs, 91-63, on Tuesday at the FilOil Flying V Centre in San Juan. The result gave them a 6-12 win-loss record to end the season — far from enough to make it to the Final 4. Still, to have concluded their campaign on a winning note was gratifying to Calisaan, a San Sebastian lifer who proudly represented the school for 8 years — three in high school, and five in college. 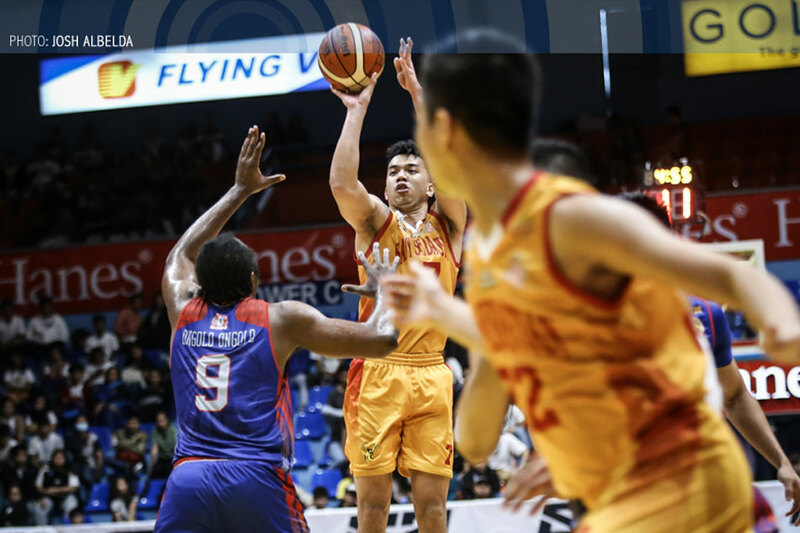 “Masaya ako kasi nanalo kami, pero may kasamang lungkot, kasi ‘yun na ‘yun eh — ‘yun na po ang last ko,” said Calisaan, who averaged 14.6 points and 9.3 rebounds per game in his final year with the Golden Stags. “Ilang taon din po ako sa Baste, at sinasabi ng mga teammates ko na last ko na rin po, kaya yun po malungkot din po siyempre, kahit papaano,” he added. Calisaan helped San Sebastian make the Final 4 in Season 93, memorably scoring 36 points in their 74-69 triumph over Colegio de San Juan de Letran in the second phase of the step-ladder semifinals. Their run ended at the hands of a familiar rival, the San Beda University Red Lions, who beat them 76-71 to seize a spot in the finals. Much was expected of Calisaan in his final year, especially after San Sebastian endured a controversial offseason that saw the departure of several key players. “Before, wala pa ‘yung sinasabing ‘exodus,’ sinabi ko kay Michael: Ito ‘yung ticket mo na maging PBA player ka as a 3-guy (small forward),” said San Sebastian coach Egay Macaraya. With their frontcourt lacking in key players, however, Calisaan wound up playing power forward and center more often than not. Even so, Macaraya believes that his prized big man showed that he can play multiple positions, and that he has the skills to be a small forward in the PBA level. “Ang maganda kay Michael, walang limit ‘yung pag-asenso eh,” said Macaraya. “Anything naman can happen. He was focused on playing 4 or 5 in the juniors, hanggang naging college, but 'yung mentality niya ngayon is he can play 3, medyo nakikita naman natin na lahat na, meron na rin siya,” he added. In his last NCAA game, Calisaan displayed his range in knocking down three of five three-pointers, while also tallying three assists, three steals, and a block. “I guess 'yun ang isa sa mga weapon na madadala niya sa PBA, or whatever career na pupuntahan niya. I'm sure na, very happy kasi he's learning much na madadala niya kung saka-sakali mang tres ang ibibigay sa kanyang pwesto sa PBA,” said Macaraya. Calisaan, for his part, is grateful to his coach for teaching him valuable skills both on and off the court, especially now that he is chasing his dream of playing as a professional. “Sa sarili ko, alam ko na kaya ko,” he said.